Powder, Sierra cement, white stuff, champagne, gnar gnar, the fluffy stuff, or whatever way you choose to call it, SNOW. As the season approaches, snow insidiously starts to creep into our minds distracting us from our daily lives. Inevitably, snow has begun filling my thoughts and made me think of an age old debate over who has the best snow. Is it the Sierra Nevadas and Cascade Mountains in California, Oregon, and Washington? Or is it the Rocky Mountains in Utah, Colorado, and Wyoming? Check it out! The leaves are changing and the wakeboard season is winding down (for many of us). Take advantage of the fall days while the weather still lets you and get out on the lake for some final runs. And for wakeboard storage in the offseason, check out our wakeboard racks - perfect for storage and display in your house, garage, or other storage spot when your wakeboards aren't in use. 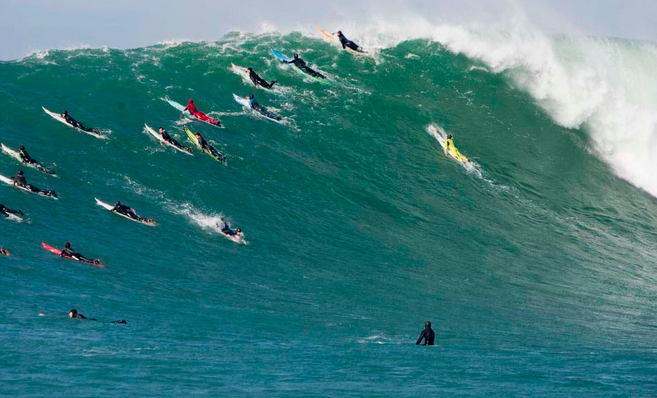 Kai Otton outlasted Nat Young today in less-than-stellar waves at the Rip Curl Pro Portugal. But the biggest news from the contest is that because Kai knocked off Mick Fanning in the quarterfinals, Mick didn't clinch the world title. Instead, the title fight will be decided at Pipe, the 10th and final event of the season, where Kelly Slater still has a shot at claiming the crown for the 12th time. He's up against it though; anything less than a win by Kelly and Mick will grab his 3rd world title. And even if Kelly wins, Mick takes homes the title if he reaches the semifinals. Unfortunately, the drama won't unfold for another 2 months, when the Billabong Pipe Masters fires on December 8. 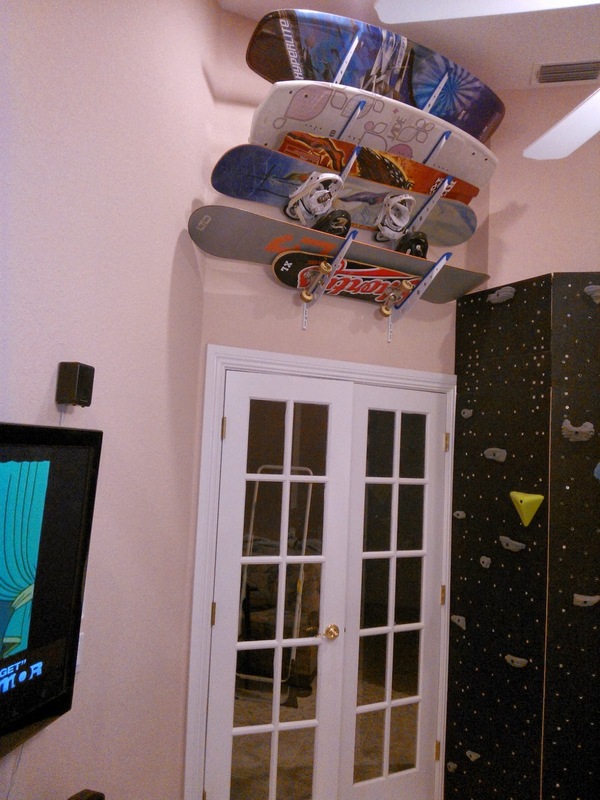 Check out this board rack setup from our friend Mario in Winter Haven, Florida. This rack has tons of versatility and it's all being put to good use with multiple wakeboards, snowboards, and skateboards. Picture proof that this rack does it all and provides a great wall storage and display option for your favorite boards. The looks are a fit for inside your house as shown here but also works in your garage or other storage areas. A nice touch we haven't seen before is the climbing wall on the right side of the frame. When you want to get your boards up and down, you have to go for a little climb. That is a really great way to bring all your sports together in the same spot. Props, Mario. Whether you are just starting out or are a seasoned veteran, getting your stance right is imperative. There are two main reasons why your stance is important. First, having the proper stance helps prevent injuries by putting your knees and ankles at more natural angles. Second, a proper stance promotes better technique when riding which will lead to lower fatigue and growth in your skills. 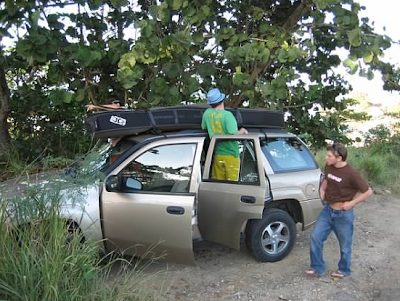 A big question when you're planning a surf trip is – should I pack my surfboards or rent them at my destination? 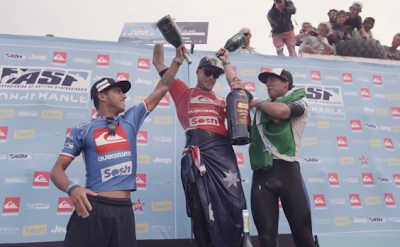 Mick Fanning defeated Gabriel Medina to claim the Quik Pro France title, finally breaking through for his first win of the season. Combined with Kelly Slater's ouster in the quarterfinals, Mick's win opened up a 5,000 point cushion over Slater at the top of the standings in the race for the 2013 world title. It's important to note that the world champ is crowned based on his best 8 out of 10 events, so the current standings are not the true point totals that will be used to calculate the champ. That said, Mick has no worse than a 9th place finish this season, meaning even if he bombed the last two events, he still would have a strong shot at ending up on top. Slater and the rest of the field have their work cut out in the last two events in Portugal and Hawaii. 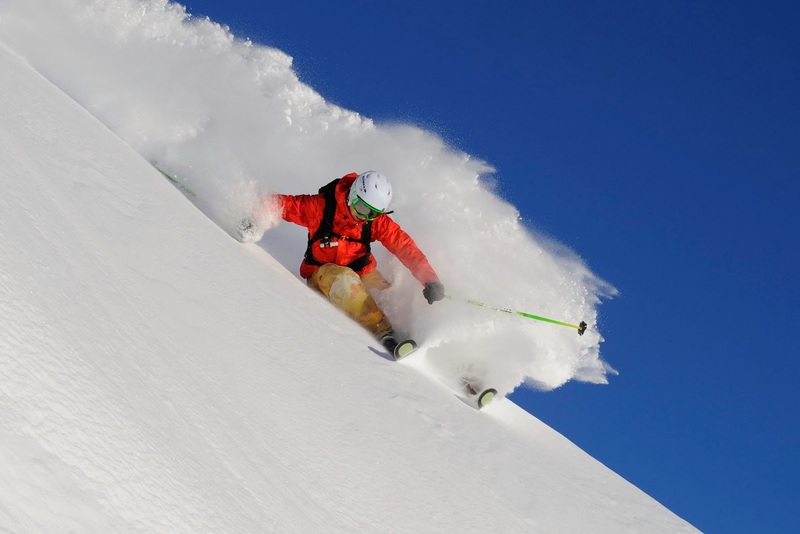 Popularized by Mervin manufacturing companies Lib Tech and GNU, the idea of serrated edge skis and snowboard has gained traction (pun intended) over the last couple of years. Also known as Magne-Traction, serrated edge skis and snowboards are designed to provide additional gripping power for your shred stick(s). The basic premise is that the wavy edge of the board provides additional contact surfaces for the board to grip the surface.